In North Texas when a developer decides to put in a new subdivision it is usually the bulldozers that lead the way. In my neighborhood, though, there is one small portion of property that was spared the usual onslaught. A one acre park still retaining its original woods. 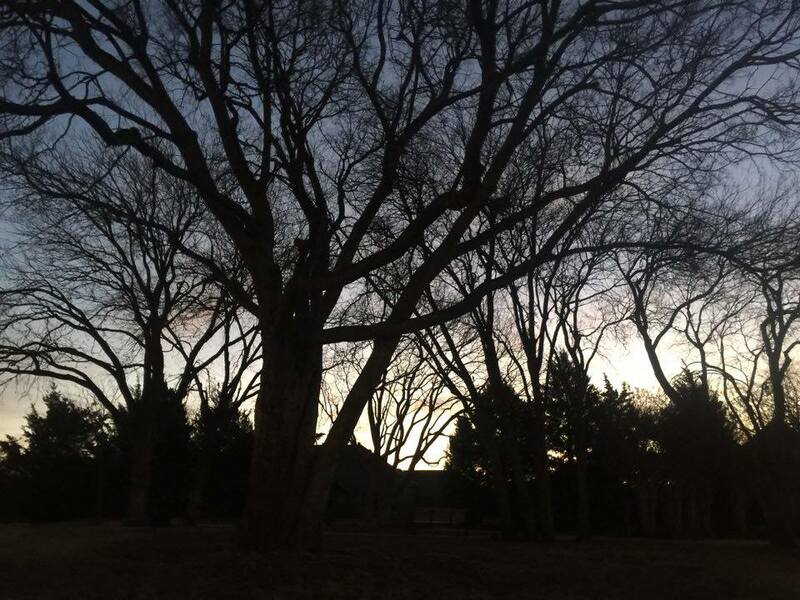 Mature hackberry and pecan trees crowd this little park. And on the margin there is a row of thick, evergreen junipers, effectively isolating the park from the closest houses. I’m very grateful that the developers decided to preserve this attractive little spot. It’s easily my favorite park in the neighborhood, and the fact that a pair of Cooper’s Hawks have been nesting there the last couple years only makes it all the more intriguing. The nesting hawks first came to my attention late last spring when reports of aerial attacks on park patrons began to hit our community message-board. Last year, this pair produced four offspring, and mamma Cooper’s Hawk was very aggressive about protecting her young whenever somebody lingered a bit too long in the general vicinity. 2015’s brood—Two females (big), and two males (small). Being late on the scene, I only monitored the nest informally last year. It was my hope that the hawks would return in 2016 so that I could sponsor a more thorough documentation. With that in mind, I kept a close eye on the nest all through the early part of the new year. I started noticing activity at the nest site late in February 2016. The male seemed to be trying to attract his mate back to the same location they used so successfully the previous year. Despite the male hawk’s best efforts, I never did see the female. Then there was an unexpected lull. Several weeks went by with no sign of either hawks. Was my timing just bad, or was there something wrong? After missing the hawks for three weeks in a row I began to get worried! Then in late March the activity at the nest suddenly picked up again! This time the intrepid male was accompanied by a big, powerful female—his mate had returned! Enter our good friends Richard Barnes and his wife Shannon. 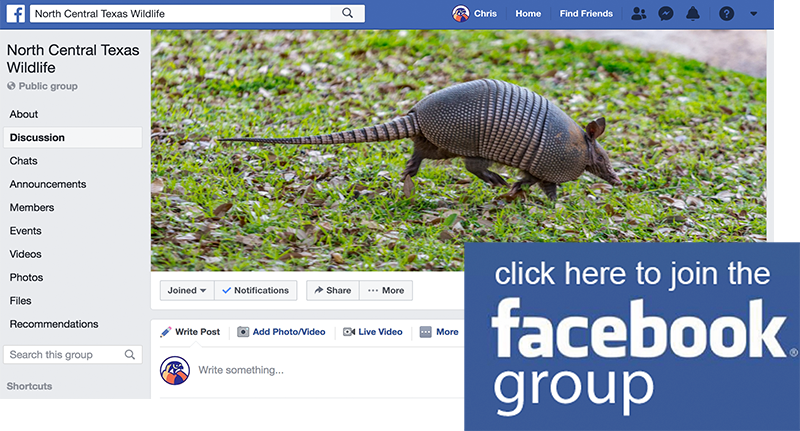 You might remember the wonderful videos of DFW area wildlife that Richard has shared with us over the past couple of years. Really amazing and beautiful stuff. Well, this time Richard and Shannon pointed their cameras at our resident Cooper’s Hawk family, and they did a fantastic job of recording the goings on at the nest throughout the spring and early summer. The Barnes were there for it all. They began recording video in late April just days before the first eggs were laid, and they continued documenting through a stormy spring, and a blazing hot June and July. Along the way it became evident that only one egg had survived the spring’s severe hail storms—a bit disappointing, but that is the way of nature. 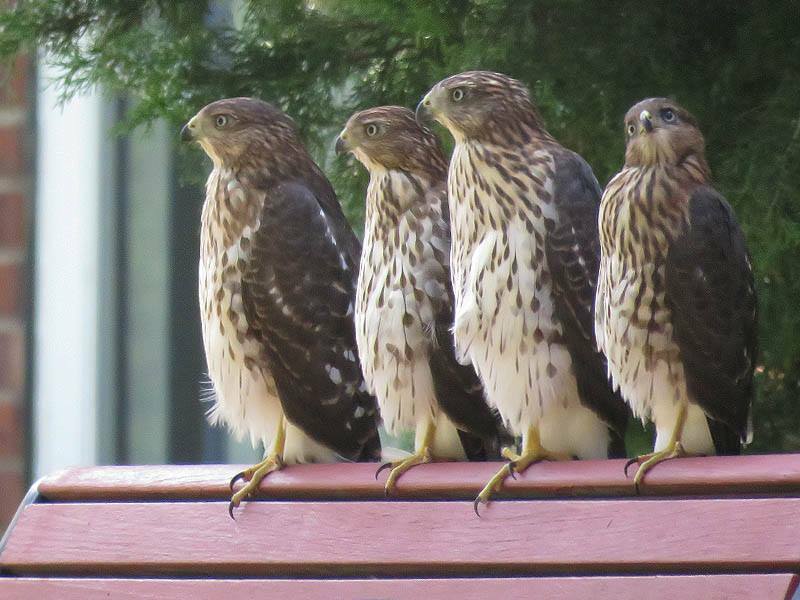 And, with only one offspring to protect, mom hawk was much more mellow this year. Not a single attack on a pedestrian was reported, though I can attest that she kept very close tabs on everyone entering and exiting the park—whether they knew it or not! You can see the result of Richard’s and Shannon’s wonderful work below. Check it out and let them know what you think! Cooper’s hawk (Accipiter cooperii) is a medium-sized hawk native to the North American continent and found from Southern Canada to Northern Mexico. As in many birds of prey, the male is smaller than the female. The birds found east of the Mississippi River tend to be larger on average than the birds found to the west. Other common names for the Cooper’s hawk include: big blue darter, chicken hawk, flying cross, hen hawk, quail hawk, striker, and swift hawk. 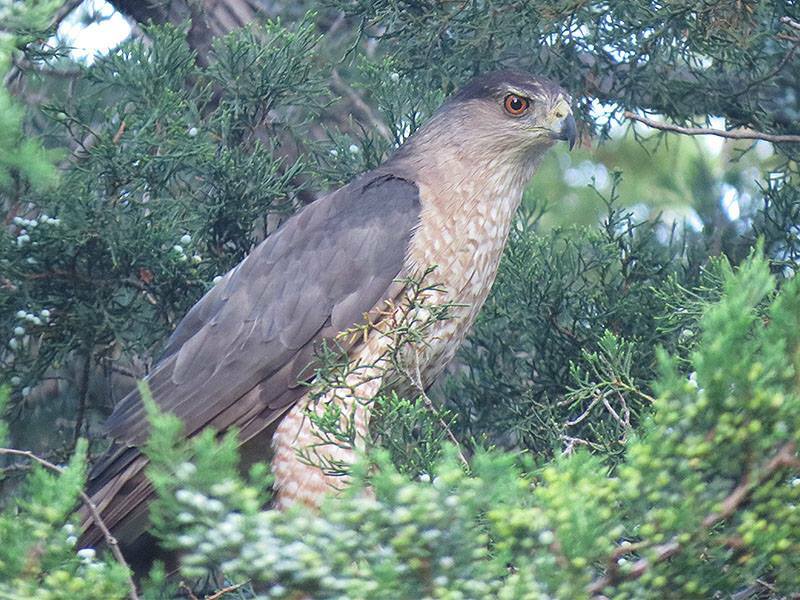 The Cooper’s hawks are monogamous, but most do not mate for life. Pairs will breed once a year and raise one brood per breeding season. Courtship displays include stylized flights with the wings positioned in a deep arc. During their flight displays the male will begin by diving toward the female. A slow speed-chase follows involving the male flying around the female exposing his expanded under tail coverts to her. The male raises his wings high above the back and flies in a wide arc with slow, rhythmic flapping. Courting usually occurs on bright, sunny days, in midmorning. After pairing has occurred, the males make a bowing display before beginning to build the nest. Their breeding habitats are forested areas. The breeding pair builds a stick nest in large trees. Over a two-week period the pair builds the nest. The nests are piles of sticks around 70 cm (28 in) in diameter and 15–43 cm (5.9–16.9 in) high with a cup-shaped depression in the middle that is 20 cm (8 in) across and 10 cm (4 in) deep. Their nests are built in pines, oaks, Douglas firs, beeches, spruces, and other tree species usually on flat ground rather than on a hillside. The nests typically are about 7.6–15.1 m (25–50 ft) high off the ground, halfway up the tree, and out on a horizontal branch. The clutch size is usually 3 to 5 eggs. The cobalt-blue eggs average about 48 mm × 38 mm (1.9 in × 1.5 in) and weigh about 43 g (1.5 oz). The female incubates the eggs between 30 and 36 days. The hatchlings are about 28 g (0.99 oz) and 9 cm (3.5 in) long and are completely covered in white down. They are brooded for about two weeks by the female, while her mate forages for food. The fledging stage is reached at 25 to 34 days of age, though the offspring will return to the nest to be fed until they become independent around 8 weeks. Eggs and nestlings are preyed on, rarely, by raccoons, crows as well as other competing Cooper’s hawks. Adults rarely fall prey to larger raptors, namely red-tailed hawks, great horned owls, peregrine falcons, golden eagles, and northern goshawks. Chris, thanks for featuring this, and for taking all of the wonderful photos we used in the video. Looking forward to seeing if they come back again next year ! Wonderful job, Richard, Shannon, and Chris. Thank you. I too had Cooper’s Hawks successfully nest (in my front yard) this year, but I am far away from DFW, in Medical Lake, Washington. The pair fledged three young. Must have been great to have that happen in your front yard, David. We were privileged to have three raised in our oak tree in 2015. They used the same nest 2016 and raised one. This year 2017 they moved to our neighbors tree and raised one. Have not seen the parents in two days. But the ” baby” is still here. He used our bird bath to drink last evening. Great to watch in urban North Dallas.